Decorate cakes and cupcakes like a pro with our 100% brand new CrownBake set. THE ULTIMATE DELUXE SET Our set combines all of the best and newest Russian pipe designs, you also get in our Deluxe set 2 newest large Sphere nozzles and a Leaf tip to add gorgeous leafs to your flower to get the absolute best result you can. Our set also includes the newest Ball Sphere tips to create fluffy decorations on your cake and cupcakes. 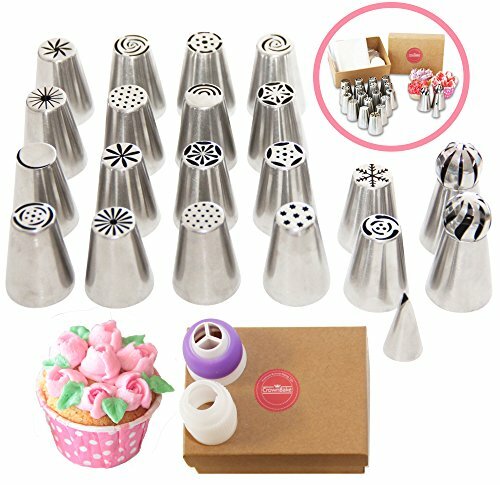 WHAT IS A RUSSIAN PIPING TIP? All you need to achieve great results is a good frosting recipe which comes for Free in our set and a few minutes of practice just to "get the hang of it"
HIGH QUALITY - Our product is made of #304 stainless steel, easy to clean and easy to use. 100% SATISFACTION GUARANTEED Our goal is to see you succeed to decorate like a pro. If you're not 100% happy with your Russian piping tips set, please send us a message and we'll be happy to assist you. ♛ FREE 12 PAGES EBOOK INCLUDED - Learn everything starting from the basics: what are Russian piping tips and why they are so special. Learn how to use them and get our tested and proven recipes. Learn how to use the different couplers and the pastry bags. All explanations including images. ♛ PREMIUM QUALITY - The tips are made of durable 304 stainless steel. Easy to clean, Dishwasher safe, built to last. ♛ 100% SATISFACTION GUARANTEED - We value our customers. Our product was hand picked and packed carefully. We are committed to your satisfaction. Got an issue? We'll be happy to assist. If you have any questions about this product by CrownBake, contact us by completing and submitting the form below. If you are looking for a specif part number, please include it with your message.